Please enter code at checkout. The deal I recommend is this one... https://www.escentual.com/all-products/leaudissey007/ Great fragrance and best price in the world right now for this. Lasts all day on skin. Trusted website... Brought from these before plus you get points. Is this going cold just cause it's a regular offer from this company or is there some other reason Need Dior Joy and no one reputable has discounted it at the moment but this would allow me to get 50ml rather than 30ml for just £6 more than I was resigned to paying. 20% off all items @ escentual.com until the 31st August 2018. Enter code ESCENTUAL20 at checkout. Free delivery on orders over £30. Don't forget Quidco/TCB. Escentual prices are normally already discounted. When they put out this code, they put the price back up to RRP. As far as I'm aware they've been releasing a code every couple of months or so this year (less in the past I think), and it varies how long it's valid for (valid for many weeks this time - longer than usual). So the offer is not available all year round really. I've posted this code in the voucher codes section and not the deals section, why not make people aware there is a code available? It might be useful to some people, especially since certain brands are rarely on offer elsewhere, and with this code savings could be had compared to other sites. I find it strange to down vote voucher codes, since they are always useful if a person will shop with that retailer anyway, or were going to shop at a similar retailer but would get a better price using a code at another. It's not like the "deals" section of the site. I'm wondering that too!? :/ I was chuffed when I spotted the code advertised on their site, I usually take advantage of the 20-25% codes they sometimes have. It's a decent discount and a fair share of items/brands on their site are rarely discounted elsewhere, so some good savings available with the code! I did check if it was already posted but nothing came up. Someone hopefully will expire this. Thank you, kept looking out for this offer! 10% Off sitewide. Ends 23.59 today. This deal ends Wednesday 19th July. 20% off	20% Off all purchases @ Escentual Fragrance, Makeup & Skincare Retailer. Heat from me.. Been after Lancôme la vie est belle for sooooo long, such a great deal!! Heat from me OP - Managed to get the Armani Code Profumo! Simply add the products to your shopping bag. Next, choose “Edit Bag / Checkout”. In the Shopping bag there is a section called “Redeem Pretty Pennies and/or Enter Vouchers”. 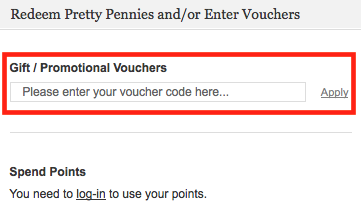 Put in your code where it says “Please enter your voucher code here” and click on “Apply”. The amount should be deducted immediately from the total of your order. Select “Proceed to checkout” and finish your order.